One thing we’ve noticed the last couple years watching the boys hunt for Easter eggs is that they run around like maniacs collecting eggs, and each time they bend over, they lose an egg or two, or all! It’s so funny, until they get frustrated and start to panic. So, this year, to make it easier on them, here’s a tote bag that is Dropped Egg Proof! Have you seen the amazing Miffy night lamp made from the popular books Miffy & Friends? It’s just amazing and catches your eye with it’s clean and minimal look. 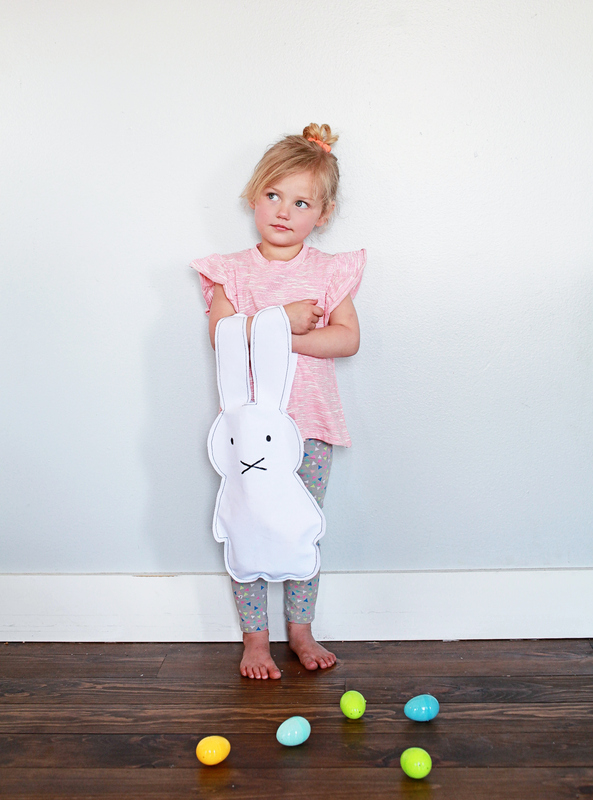 So with both of these two thoughts floating around, the Miffy Easter Tote was born! For this project we used white duck cloth (3/4ths a yard is plenty!) for this tote for a couple reasons: It’s super thick and durable. And it hardly frays. So you don’t HAVE to hem it. CUT out the shape, and repin inside the Miffy shape. Now for the sewing part. 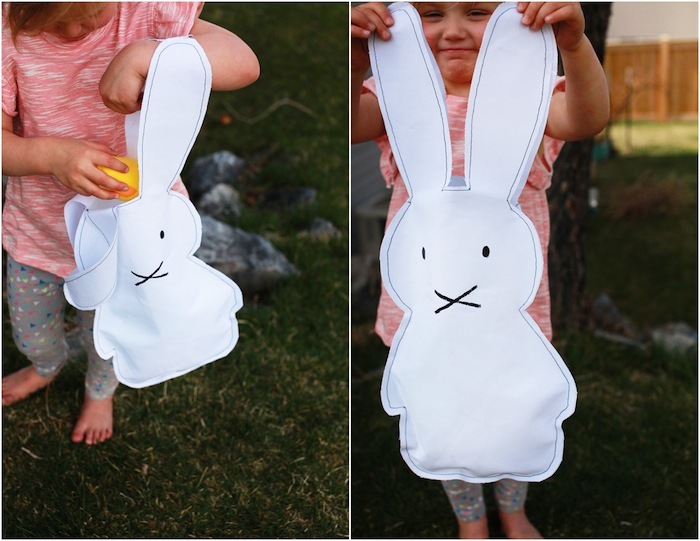 At first attempt, I sewed the tote and then turned it inside out, but the seam allowance changes the shape of the thick fabric so much, it almost didn’t look like Miffy anymore. So, sewing on the outside allows you to maintain the shape that you free-hand a lot better! Now to PAINT Miffy’s face. I say paint before sewing because if you have a mess-up it’s a lot less annoying to start over only one step into it then ten. Miffy’s signature look is long bean-shaped eyes spread pretty far apart and then a wide X for a mouth. I used acrylic paint and let it dry completely before the next step! Now for the wheres and hows of the thread: And, like my blogging inception buddy, I used BLACK THREAD for all except when sewing the very tip-top of the ears which are the tote’s handles. Use white for that small part, you hardly notice it and it doesn’t mess-up the clean black outline you’re going for. To make this a functional tote bag, you only need to SEW the two identical pieces of duck cloth together on the bottom, and then up the sides stopping before Miffy’s head turns to Miffy’s ears. Then, the rest of the sewing is just for looks and to create continuity of the black outline. At this point you’ll have the start of a tote but the ears will still be separate from one another. This is what you want! 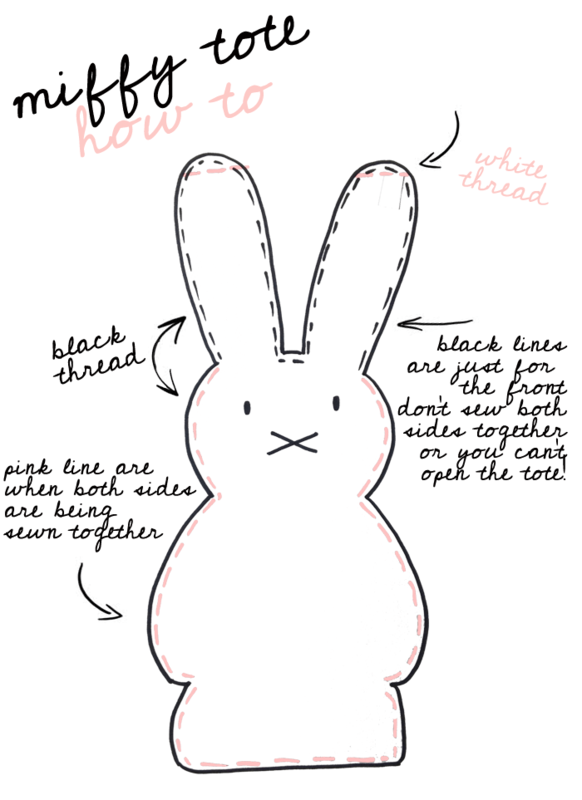 From here, you will take only the top (the one you painted Miffy’s face on) piece’s ears, and you’ll sew up the sides, around the ears and back down, creating the black thread outline. Your ears will still be separate from one another but, they will have the black outline now. Almost done! Now, change your sewing machine to WHITE THREAD. To create the tote’s handles, simply pin the front piece’s ears to the back piece’s ears and sew straight lines across the very top of the ears creating the tote’s handles! It sounds complicated when I am explaining it now, but it honestly took 5 minutes. Lola’s “Balini” top via Wunway, thank you to Dear Lizzy for these photos and use of her darling daughter Lola! Perfect! So doing this so we have a tote for this weekend’s easter egg hunt! Might have to use stashed pattern fabric, but the bunny shape is cute enough 🙂 thanks for sharing!